Colorful and elegant Sterling silver jewelry, with designs inspired by nature and a clean modern aesthetic. 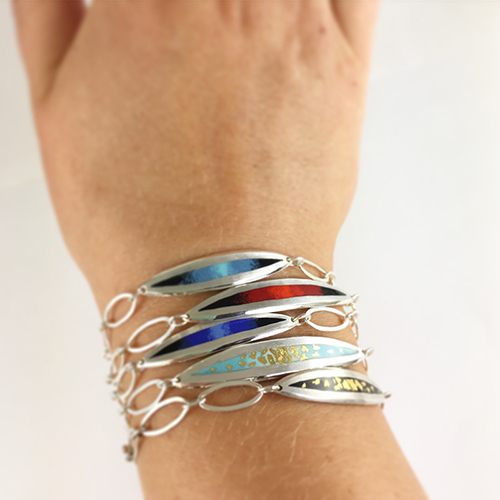 These stackable sterling silver, bracelets have one enameled element, either in an ombre of contrasting colors, or with 23K gold flakes fused into the glass. Each bracelet is fully adjustable and available in a range of colors. One of my best sellers! 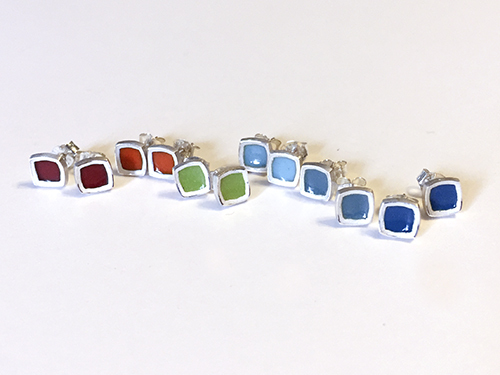 Available in 12 colors, these delicate earrings have vitreous enamel fused into sterling silver. To create contrast, the silver has a matte finish, with a bright shine on the highest edge to add just a hint of sparkle. For this series of jewelry I use a unique texturing process to create a pattern of color that actually sits into the silver background. Small indentations are made in the silver sheet, the sheet is cut and formed, the indentations are then filled with contrasting colors of glass enamel, then sanded to a smooth satin finish, to create a bold pattern. Because the enamel is placed by hand, and the firing process is different every time, no two pieces are exactly alike. 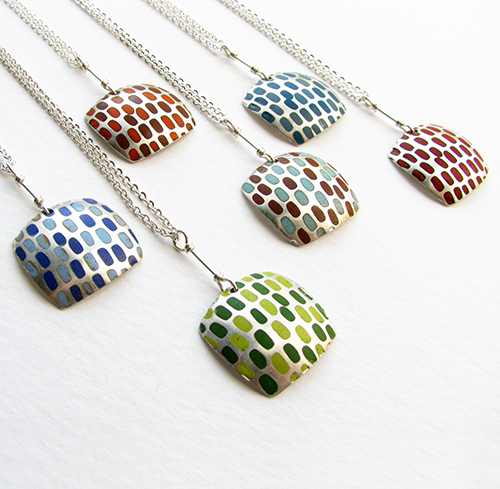 Each of these Sterling silver pendants has a unique pattern of deep hammer texturing across the surface. I use a dark patina to create contrast with the brushed silver surface. They range in size from .5 to 1.25 inches in height. 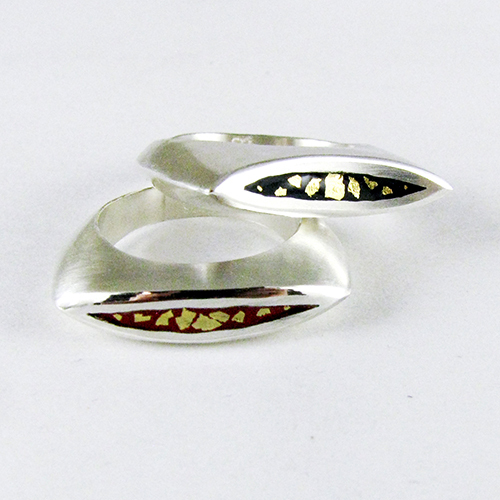 Each of these rings is crafted with a thin chanmel in the top surface. This space is filled with a bold glass enamel, with flakes of 23K gold foil fused into the surface to add texture and pattern. Each piece of jewelry in my flame series is made up of one layer of enameled copper, and a background layer of sterling silver. 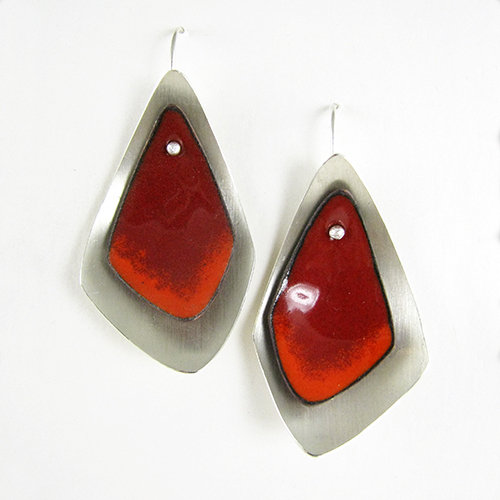 I love how the bold colors of the enamel are reflected by the soft shine of the satin silver background. This jewelry moves with the wearer, and the layers dance like flames.